9.2"/31.5 (23.4 cm) Mark VI on Monitor M21 in 1915. 9.2"/31 (23.4 cm) Mark VI gun at Gibraltar in October 2005. Photograph copyrighted by Caspar Vermeulen and used here by his kind permission. Hooped trunnion guns that differed in some construction details and some external dimensions. Used by both the Army and Navy during the late 1800s. Used both on new construction and to replace old muzzle-loaders on existing ships. As ships were scrapped in the early 1900s, a total of 27 guns were transferred to the Army between 1904 and 1907, but only four of these were actually used for coastal defense and the rest were scrapped. During World War I many small monitors were to be armed with Mark VI guns removed from old Protected Cruisers of the Edgar class. However, the Army now had a shortage of 9.2" (23.4 cm) guns as a result of the earlier gun scrapping, so some monitors never received 9.2" (23.4 cm) guns and others had theirs removed and received 7.5" (19 cm) guns in their place. Mark III was constructed of A tube/breech piece taking breech screw, B tube, 5 B hoops to the muzzle/jacket, 1C hoop, trunnion ring, 2C hoop. Bronze sheath over the jacket for balance. Mark IV differed in having a liner for half the length of A tube, no 1C hoop and no bronze sheath. Mark IVA had separate bore and chamber liners. Mark V had a full length liner and alpha tube/A tube/breech piece taking breech screw, B tube, B hoop not to muzzle/jacket, trunnion ring and C hoop. Mark V* designated gun number 44, which had burst at the muzzle in 1897 while on Galatea. It was rebuilt to a partly wire wound design. Mark VI was A tube/breech piece taking breech screw, 1B, 2B tubes to muzzle with 1C and 2C tubes for part length/jacket, trunnion ring and D hoop. Mark VIA had a thicker A tube and shorter 1B tube. Mark VIB had 1B tube replaced by 1B and 2B hoops. 2C tube replaced by C hoop. Mark VIC had 1B tube replaced by 1B and 2B hoops. Breech screw in bush screwed into jacket. Mark VII was A tube/breech piece, B hoop, B tube to muzzle/1C, 2C, 3C/jacket, trunnion ring, D hoop. The breech screw was in a bush screwed into the breech piece and 1C. All of these guns as completed had a three-motion interrupted screw breech. The addition of a * to the Mark number indicated that the front slope of the chamber had been reworked to prevent slip-back at high elevations. Gun number 44, the Mark V*, was also reworked to this standard and then designated as Mark V**. 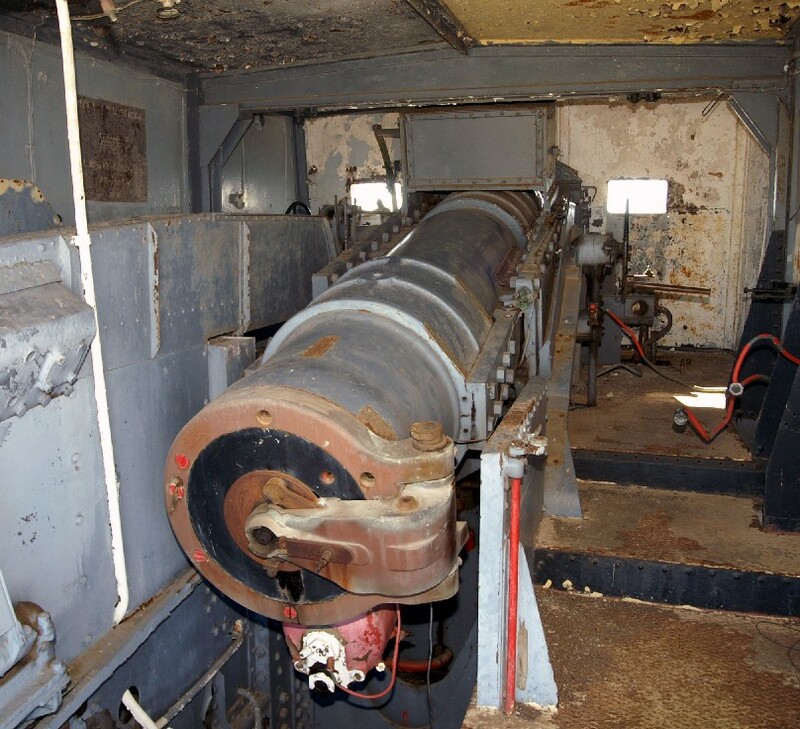 Some coastal defense guns were modified to a continuous motion breech and then given a "B" prefix. C and UC prefixes to early Army guns meant the presence or absence of a hinged carrier for the three-motion breech. Total number of guns made was 4 Mark III, 28 Mark IV, 18 Mark V, 61 Mark VI and 1 Mark VII. ^Steel choke was a problem for these weapons, with M.19 suffering a premature detonation that burst the barrel about 18 inches (45.7 cm) forward of the trunnions. 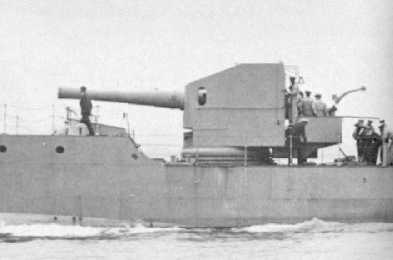 ^Monitors M.25, M.26 and M.27 never received their 9.2" (23.4 cm) guns while M.21, M.23 and M.24 had theirs replaced in 1916-17 with 7.5" (19 cm) guns. ^The stated ROF for monitors was 0.5 rounds per minute. 163 lbs. (73.9 kg) Pr. Br. 2,065 fps (629 mps) Pr. Br. ^The outfit on Monitors was 60 rounds CP plus 60 rounds HE. Taken from range tables, but John Campbell calls these figures "optimistic," especially the 30 degree value.